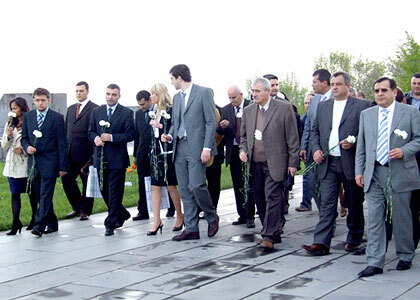 19.09.2007 The foreign affairs committee of the Italian Chamber of Deputies, with the participation of president Umberto Rainier, Marguerite Biniver, Leoluca Orlando, Raffaello De Brasi and the secretary of the Committee, Mario Di Napoli, visited Tsisernakaberd Memorial Complex and put a wreath to the Memorial to the Armenian Genocide victims.They also visited Museum-Institute of Armenian Genocide. 06.09.2007 First Secretary of the French Socialist Party Francois Hollande, accompanied by Kiro Manoyan and Hrant Margaryan, visited the Armenian Genocide Museum & Institute and put a wreath to the memorial to the Armenian Genocide victims. Mr Papoulies wrote in the Commemoration Book:вЂќThe Memorial Complex is the expression of all those yesterdayвЂ™s victims, who claim for justice from the todayвЂ™s aliveвЂќ. 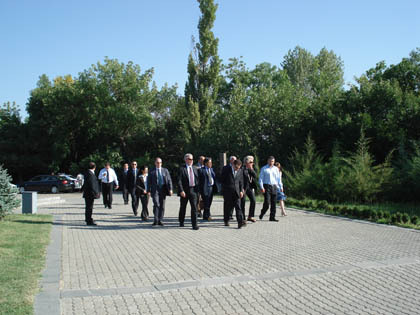 31.08.2007 The chief executive of Liberal Judaism organization Rabbi Danny Rich and genocide educator Ruth Barnett with two representatives from Liberal Judaism visited Tsisernakaberd Memorial Complex. Rabbi Danny Rich planted a fir at the Memory Alley and visited the Genocide Museum. Pray-in ceremony was made at the tree planting site. Guest were hosted by Hayk Demoyan, the director of the Armenian Genocide Musuem & Institute. 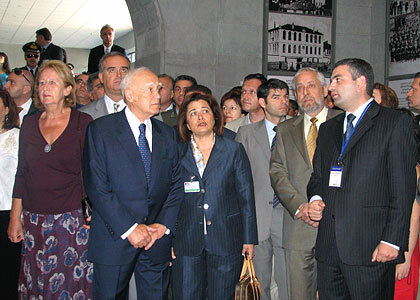 27.06.2007 Greek President Karolos Papoulias and his wife, accompanied by Armenian Foreign Minister Vartan Oskanyan, visited Museum-Institute of Armenian Genocide and put a wreath to the Memorial to the Armenian Genocide victims. 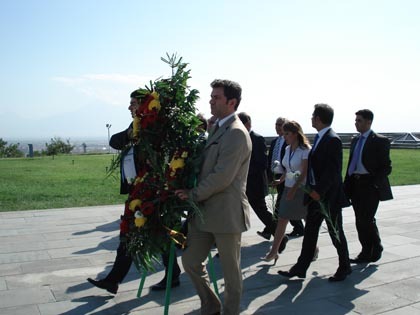 Karolos Papoulies planted a fir at the Memory Alley and visited the Genocide Museum. Mr Papoulies in the Commemoration Book wrote: вЂњThe Armenian Genocide is a black page in the history of humanity and the fact of the Genocide should be at least recognizedвЂќ. Hayk Demoyan, the director of Museum-Institute of Armenian Genocide, handed the Greek President a Memorable Medal. 03.05.2007 World Chess Champion, Russian Vladimir Kramnik and Armenian Grand Master Levon Aronyan visited Museum-Institute of Armenian Genocide. They laid a wreath at the memorial in memory of the victims of Genocide and also planted a fir at the Memory Alley and visited the Genocide Museum. World Chess Champion Vladimir Kramnik noted at the honorable guests registry of the museum: вЂњI hope this miseum will remind of the crimes committed against humanity and will help to prevent such crimes in futureвЂќ.